"Breeding outstanding temperaments for the dog of your dreams. 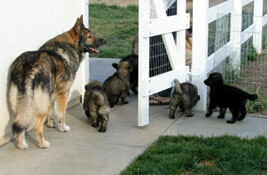 Check out our website for photos of our rare breed Shilohs, their puppies, and meet our families. Sierra Shiloh Shepherds is located in the beautiful mountains of the Sierra. All of our puppies are born inside and live in our home. They are handled from the minute they are born. They are socialized carefully with our children and other animals as they grow older. By the time they are ready to go to their new homes, our puppies have been exposed to many things. This is the first step in the all important socialization process. At the heart of our success is our philosophy of placing the right puppy into the right home. To this end we temperament test all of our puppies at seven weeks of age. We believe taking the time to evaluate our puppies before sending them to their new homes assures both puppy and owner a rewarding and wonderful life together."